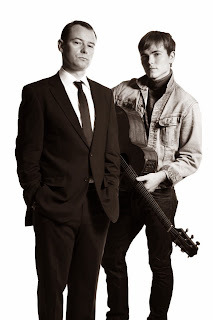 Help us in bringing the story of Beatles manager and music entrepreneur Brian Epstein to London's West End stage. 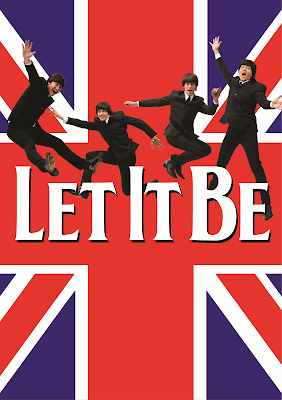 We are asking all Beatles fans to join us and be part of an historic journey to take this new Beatles play to London's West End. We want to take the story of The Beatles manager Brian Epstein and tell his untold story to a National and International audience and we are nearly there. By joining together as fans of the Beatles to support the transfer, you can play your part in helping us to make this happen. 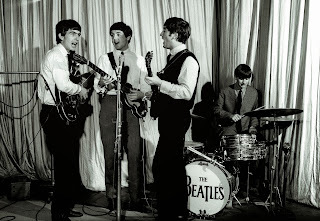 We have the venue, we have the cast, we have the crew; now we need YOU to help us by supporting this production and getting it out there to our fellow Beatle fans across the Globe and joining us by giving as little or as much as you can in exchange for the various rewards on offer. Your support will enable us cover the cost of making the necessary transformation of the production for a West End Audience and assist us with the Marketing budget needed to promote a show such as this in London. Acclaimed stage and TV actor Andrew Lancel (Coronation Street, The Bill) and newcomer Will Finlason will return to the roles of Brian Epstein and the fictional character ‘This Boy’ respectively, for which they each received rave reviews during the initial Liverpool run, where the show premiered in November 2012 as part of the city’s officialBeatles 50th Anniversary celebrations at the Epstein Theatre. Running from 5 August – 6 September 2014 (previews from 30 July) at London’s Leicester Square Theatre, Epstein: The Man Who Made The Beatles is brought to you by Bill Elms & Jen Heyes Productions Ltd and written by Andrew Sherlock (Wall Talks and The Shankly Show), who all hail from the city. We will get by with little help from our friends. Last year I felt privileged to be part of the audience in the Epstein Theatre when "Epstein: The Man Who Made the Beatles" played nightly to packed houses. The first time I saw the play, there were many people sitting near me who had known Brian personally. Their gasp of recognition, and of approval, when Andrew Lancel first stepped on stage echoed around the theatre, as did the resounding applause at the end of the play. In my review, I said, "Thank you Andrew, Will and everyone associated with "Epstein" for bringing Brian alive again and for giving him his rightful place in the Beatles' story and in my love for The Beatles. I never knew how much I missed Brian's presence until last night. Now, I'll never forget." Everyone should have the chance to see this superb play and that is why the British Beatles Fan Club is also urging Beatles fans everywhere to support this Kickstarter project. Every little helps, and there are some great rewards available for a donation of as little as £5.00. Please help! 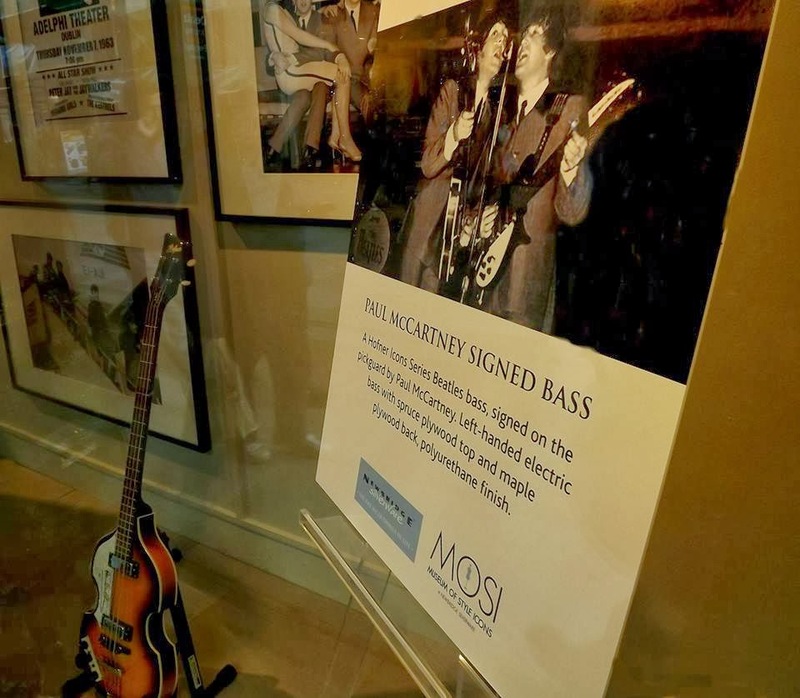 Own a Piece of History and Support the Linda McCartney Centre! Would you like to own a piece of St Peter's Church Hall, the place where John Lennon was first introduced to Paul McCartney on July 6 1957? Well, here's your chance to do that, and to help support the Linda McCartney Centre in Liverpool! Recently, St Peter's Church made some floor blocks available for sale as part of its fund-raising efforts. These blocks were removed when a fire in one of the side rooms of the hall in 2001 resulted in the replacement of small areas of the floor. 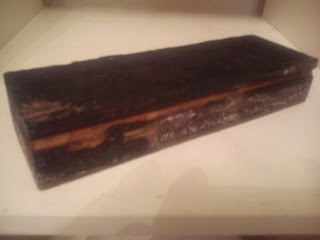 All the floor blocks which had suffered various degrees of fire damaged were saved, and a very limited number have been made available for sale. 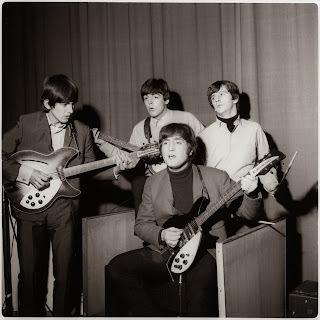 One sold at the Beatles Auction at LIPA for £250 and another sold here on ebay for £1750! St Peter's Church also donated a floor block to Cavern Mecca - a Liverpool based fund-raising group - and the floor block has been listed on ebay on behalf of Cavern Mecca and with the full support of St Peter's Church. Cavern Mecca was the first Beatles museum in Liverpool, set up and run by Liz and Jim Huges in 1981. It ran for a number of years and was the springboard for annual Beatles Convention in Liverpool which has now grown into the huge International Beatle Week festival. Liz Hughes sadly died of caner some years after its closure. Two years ago the first Cavern Mecca reunion was held in the original premises in Mathew Street (now an Irish pub). All proceeds from the reunion went to charity and it has now become an annual event (now held at the Cavern Club) raising thousands for various charities. 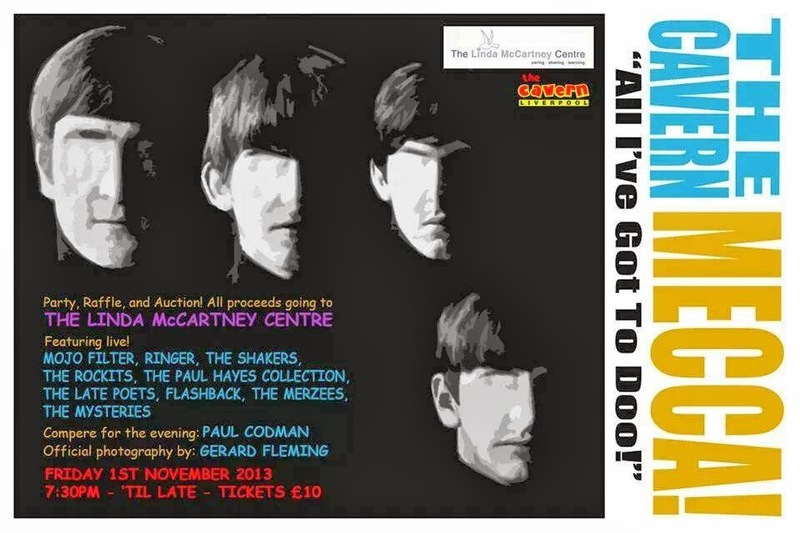 The Linda McCartney Centre, a cancer charity, will be the recipient of all proceeds raised at this year's event (to be held on November 1), and all proceeds from this sale will be donated to the Linda McCartney Centre on behalf of Cavern Mecca. The Floor Block will come with a Certificate of Authenticity (pictured here), personally signed by the Rector of St Peter's, Revd. Kip Crooks. 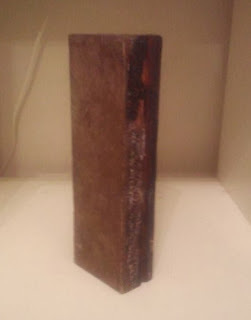 As stated on the Certificate, the wooden floor block formed part of the original floor in the Church Hall at St Peter's where John Lennon met Paul McCartney on Saturday 6th July 1957. Cavern Mecca has listed this floor block with the complete support and endorsement of St Peter's Church. A representative of the Church told us, "we are delighted to support this event, and this very worthy cause. We hope that the sale of the floor block raises a lot of money for the Linda McCartney Centre, and we wish Cavern Mecca every success with this sale." There are a few tickets left for this year's annual Cavern Mecca Reunion event, at the Cavern Club Liverpool on Friday November 2. 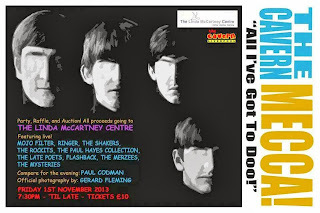 Contact Julie Sudbury via the Cavern Mecca Facebook Page HERE for more details or to buy tickets. Four suits, used as part of the promotion for the film A Hard Day's Night are on display in the windows of Arnotts department store in Dublin until 11th of November as part of the city's celebration of the 50th anniversary of the Beatles playing in the city back in 1963. This is the first time the four Beatles suits have been displayed outside of their normal environment at The Museum of Style Icons. The autographed left-handed Hofner Violin bass also on display at Arnotts was obtained by way of auction by Newbridge Silverware but never in fact used by Paul. The museum of Style Icons at Newbridge Silverware visitor centre in County Kildare had its official opening to the public in 2009 and has welcomed thousands of visitors countrywide to its spectacular showcase. Located onsite at the Newbridge Silverware Visitor Centre, the Museum of Style Icons is a permanent exhibition dedicated to design and style excellence. 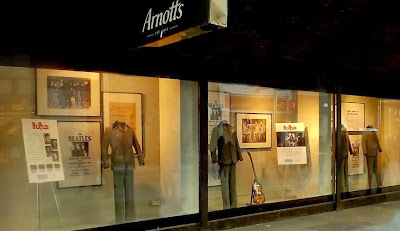 These suits were provided for the Beatles by Dougie Millings and his son Gordon. Dougie charged £31 per suit, and was also given a cameo role in A Hard Day’s Night – the part of the tailor. 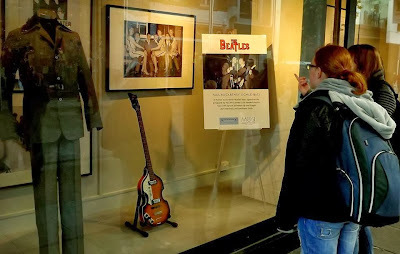 Dougie also made the suits for the original Madame Tussaud’s waxwork figures of the Beatles. 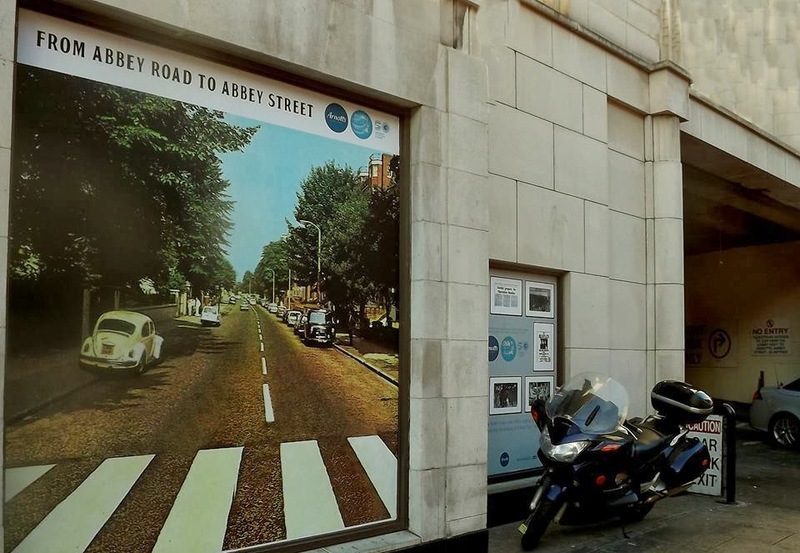 Arnotts is also marking the anniversary with a photo display at the rear of the store: Abbey Road to Abbey Street Dublin. This marks the site of the Adelphi Cinema where the Beatles gave their only concert in Dublin in November 1963. The Adelphi Cinema in Dublin’s Middle Abbey Street was a 2, 300-seat movie palace in an Art Modern Style designed by the English cinema architect W.R. Glen for the ABC group and opened in 1939. The façade was symmetrical, with art deco detailing. The tall windows once lit a fashionable balcony café. A streamlined canopy underneath the second-storey windows originally covered the entrance, with its six pairs of elegant doors. 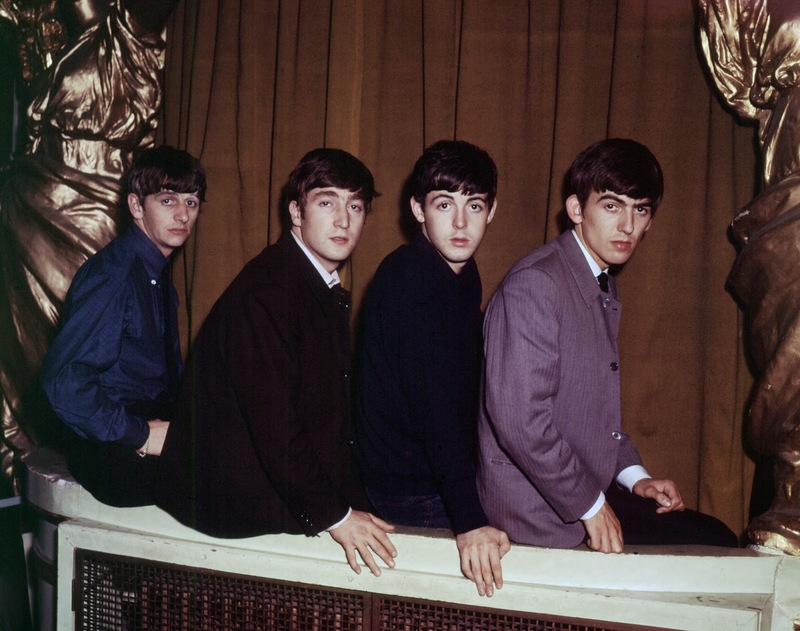 While primarily a cinema, the Adelphi did feature live acts as well, most notably the only appearance in Dublin by the Beatles in 1963. Other performers to appear at the Adelphi included Marlene Dietrich, Louis Armstrong, Diana Ross and Roy Orbison. In 1976, the cinema was triplexed, and later became a quad. Open until 1995, the Adelphi was demolished shortly after and part of its façade retained to provide car parking for the expanded Arnott's Department Store. Not only was the fine entrance removed to provide a massive holding area for cars, but the façade was clumsily extended upwards to mask the taller building. This is obvious to all, as the stonework has failed to weather to the same colour. 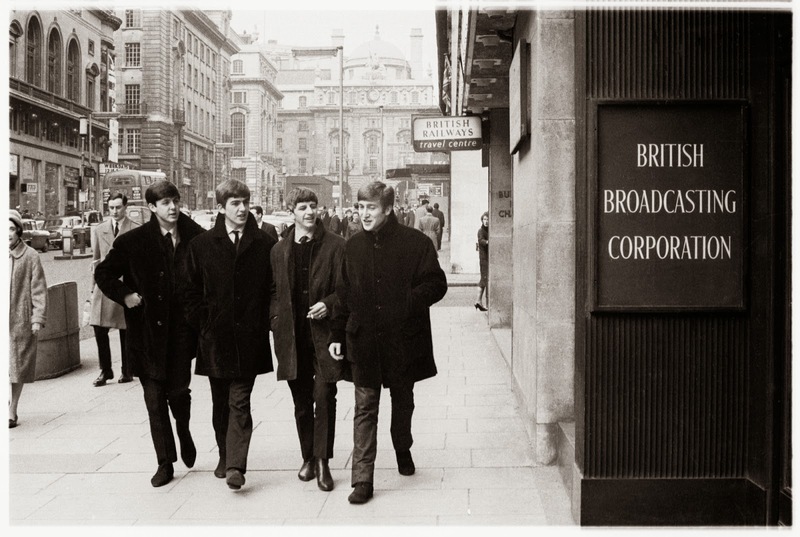 "Mark Lewisohn's biograohy is the first true and accurate account of the Beatles, a contextual history built upon impeccable research and written with energy, style, objectively and insight. This book is for anyone who wishes to own the complete story in all its stunning and extraordinary detail, and is the first volume covering the period up to 1962 in 950 pages." Please e-mail treasurer@britishbeatlesfanclub.co.uk by 30th November to express your interest so we can place an order with the publishers. We will e-mail you with payment details in due course. 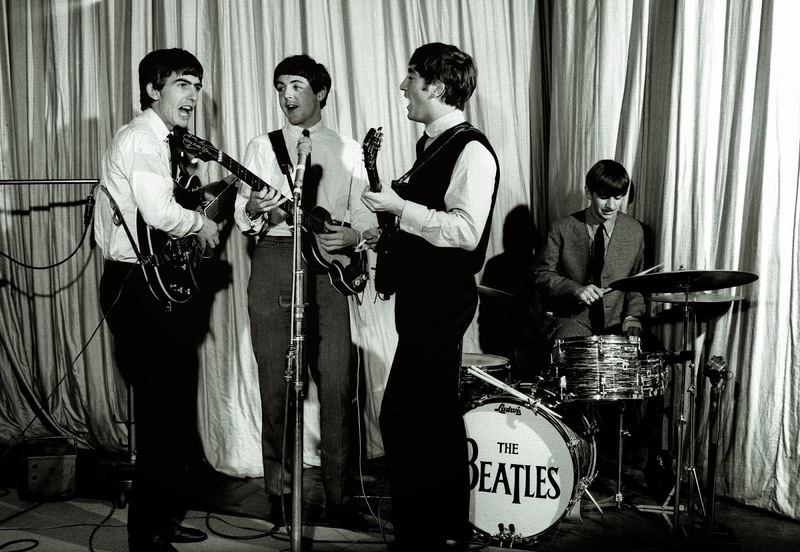 In 1994, The Beatles’ Live at the BBC was released to worldwide acclaim - hitting number one in the U.K., number three in the U.S. and selling more than five million copies within six weeks. 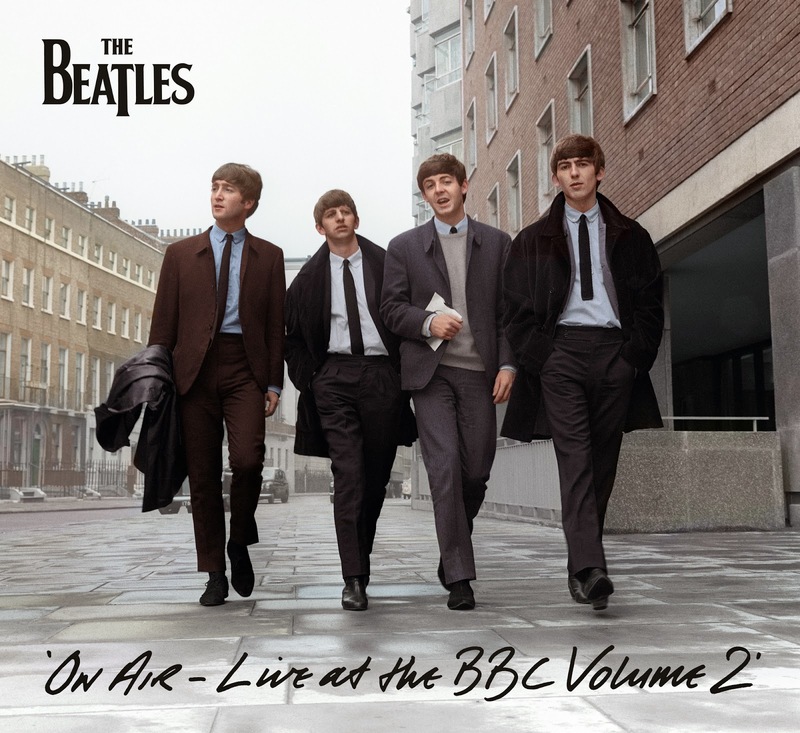 A new companion to The Beatles’ first BBC collection, On Air – Live at the BBC Volume 2, will be released Monday, November 11 in 2CD and 180-gram vinyl packages with a 48-page booklet. 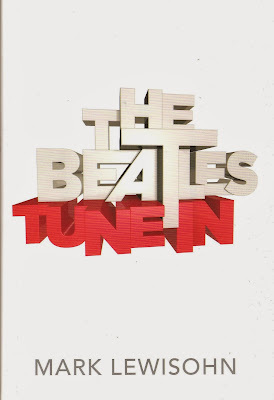 On Air’s 63 tracks, none of which overlaps with The Beatles’ first BBC release, include 37 previously unreleased performances and 23 previously unreleased recordings of in-studio banter and conversation between the band’s members and their BBC radio hosts. “Top Gear”. BBC Playhouse Theatre, London. 17 November 1964. 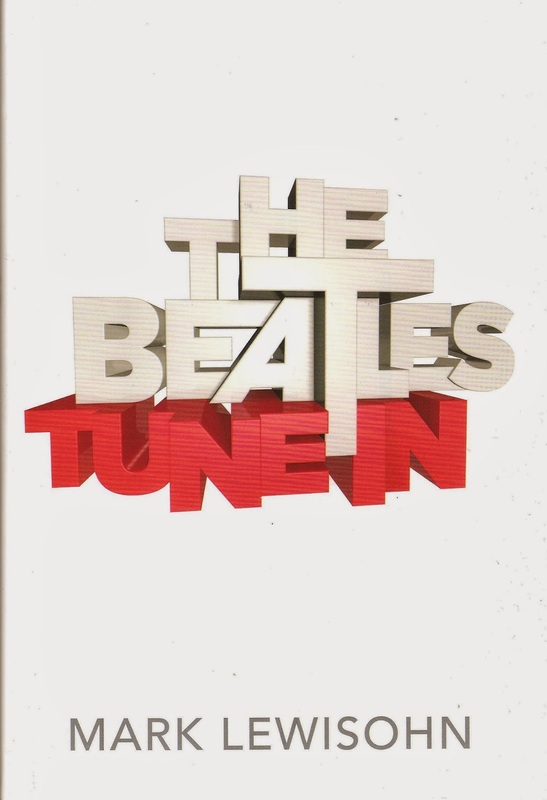 Like its critically acclaimed predecessor, On Air - Live at the BBC Volume 2 includes audio of The Beatles talking to DJs Brian Matthew and Alan Freeman and Pop Go The Beatles hosts Lee Peters and Rodney Burke. When first broadcast, pop fans were amazed to hear such witty irreverence on the rather formal BBC and it is great fun to hear these extracts now. 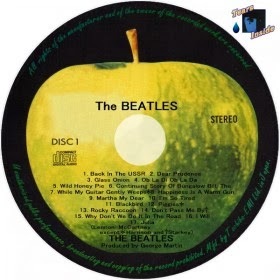 In addition, On Air releases, for the first time, the group’s candid interviews for the Pop Profile series recorded in November 1965 and May 1966. Newly remastered for reissue on November 11, The Beatles’ first Live at the BBC album sounds and looks better than ever. 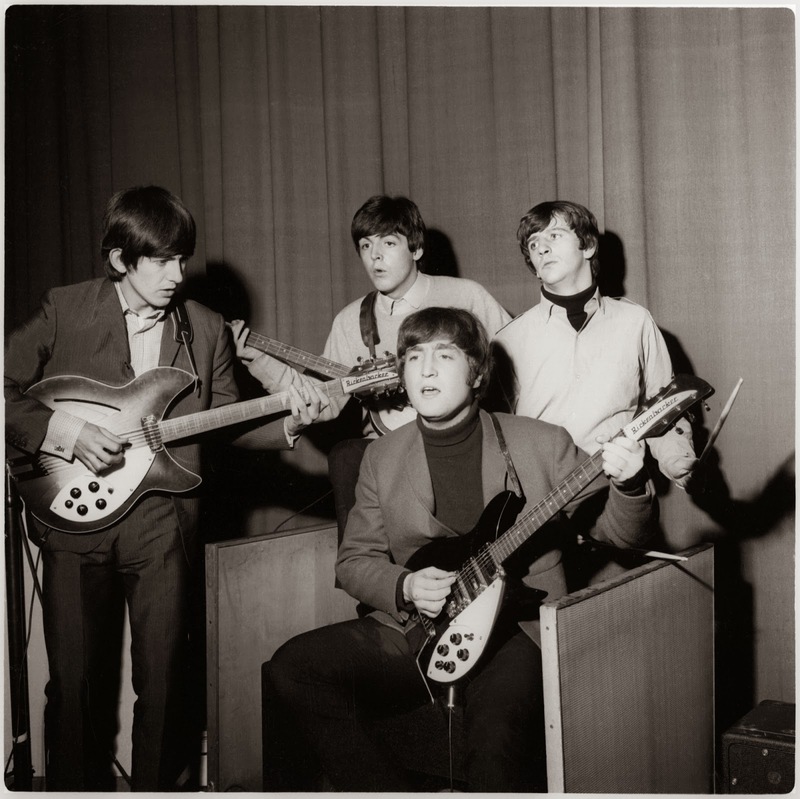 This collection of the group’s BBC sessions mixed versions of their hits with a treasure trove of 30 songs The Beatles performed on air but never released on record in the 1960s. 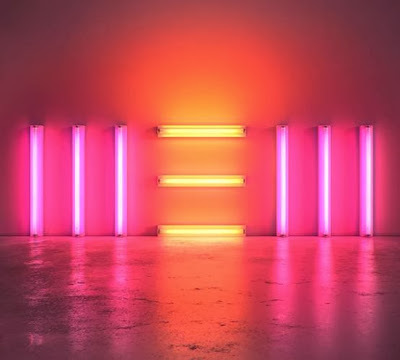 The compelling track list ranged from a rare performance of the little known Lennon-McCartney original “I’ll Be On My Way” to covers of classic rock ’n’ roll and contemporary rhythm and blues songs. 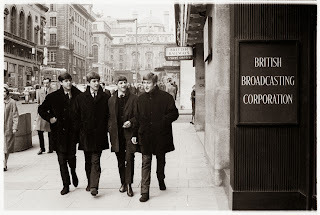 At the time of its release, Live at the BBC was hailed by Rolling Stone as “an exhilarating portrait of a band in the process of shaping its own voice and vision.” It earned a GRAMMY® Award nomination for Best Historical Album.